Connor McDavid will take aim at winning a third-straight scoring title, but will it be enough to drag the Oilers to the post-season? When your lineup includes the No. 1 player in the game, the best-case scenario involves a lot of hockey in May and June. That was supposed to be the case last season, but when most of the roster underachieved, it meant a long summer instead. So why should this season be any different? Especially when the only roster changes were adding a pair of bottom-six forwards, a third-pair defenseman and a backup goalie. The answer is because the core of this lineup made it to the second round of the playoffs two years ago. Connor McDavid can’t help but bring out the best in whoever he plays with – whether it’s Ryan Nugent-Hopkins on the left wing and Leon Draisaitl or rookie Kailer Yamamoto on the right wing, or the occasional double-shift on the fourth line. The Oilers also expect Milan Lucic, Ryan Strome, Jesse Puljujarvi and Drake Caggiula to have bounce-back or growth seasons to bulk up the middle six. Goaltender Cam Talbot proved for two years he can handle a heavy workload. But when he started breaking down last season, it became imperative Edmonton secure a proven backup. Mikko Koskinen is coming off an outstanding season in the KHL. The Oilers would’ve loved to have made a pitch for one of the many offensive defensemen on the free-agent market over the past couple summers, but salary-cap constraints made that impossible. 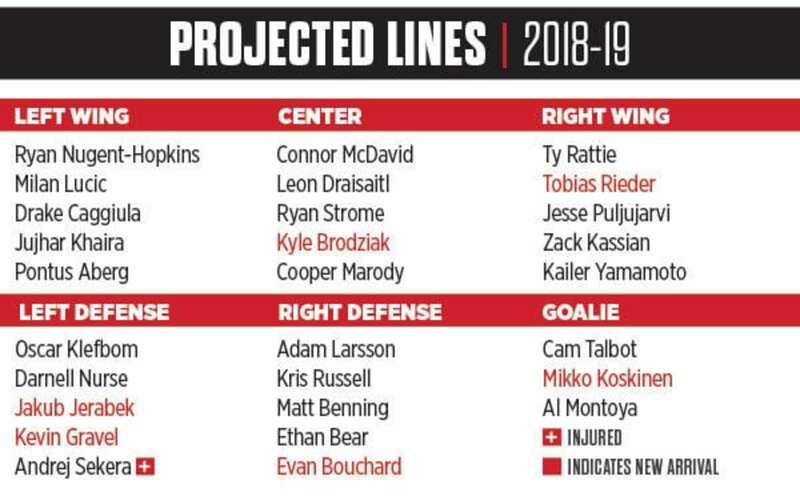 Instead, Edmonton enters the 2018-19 season with the same six blueliners as a year ago, plus Jakub Jerabek as a spare. The off-season injury to Andrej Sekera opens the door for 2018 first-rounder Evan Bouchard to make the team at 18. The Oilers badly need a defenseman with an offensive bent, but the odds are stacked against Bouchard making a significant difference as a rookie. Ahead of him on the depth chart, the Oilers are committed to a cast of blueliners who are suited to defensive roles, even though the rest of the league is moving toward a more mobile back end. There’s no denying Edmonton is behind the curve on the NHL’s shift to speed and energy. A power forward like Lucic is a beast around the net and one of the game’s toughest customers in corners, but he’s slow getting to action areas and is eating up a lot of cap space for five more years. The supporting cast for McDavid is coming. Problem is, due to cap constraints, the only way to grow is from within, and that’s going to take a while. Does Talbot bounce back from down season? We know the Oilers are going to put points on the board. With a generational offensive superstar like McDavid, who will be gunning for his third consecutive Art Ross Trophy, that’s a no-brainer. Even when dealing with down years from the majority of the offense, McDavid’s production still saw Edmonton boast a near league average attack. So, scoring shouldn’t be a concern. Whether the Oilers can outrun their defensive woes and get the goaltending necessary to compete in the Western Conference should be, though, and turning things around might fall on the shoulders of Talbot. During his second season in Edmonton, Talbot was excellent. Starting in an incredible 73 games, Talbot was in the Vezina Trophy conversation thanks to his .919 save percentage, seven shutouts and 42-win season. But in a 67-game season in 2017-18, Talbot was mediocre at the best of times. His SP dipped to .908, his goals-against average ballooned to 3.02 and he lost a league-high 31 games. Not ideal. The Oilers know full well that their blueline has holes. It had holes when Talbot nearly made the Vezina top-three, though. So if Edmonton is going to make up for its shortcomings on the backend, and if the Oilers are going to get back to the post-season, it’s going to come down to Talbot. THE HOCKEY NEWS’ PREDICTION: 6th in the Pacific Division. The depth simply isn’t there to support McDavid and the defense doesn’t have the depth necessary to keep up in the Western Conference. If Talbot struggles and Koskinen can’t handle the backup workload, it could be a long season in Edmonton.